What's going on here with these two eversible tentacle-like things? You can also see one that is coming from the individual on the lower right of the frame. Pending confirmation, this may be the first record of this species in the US. Great series of shots! 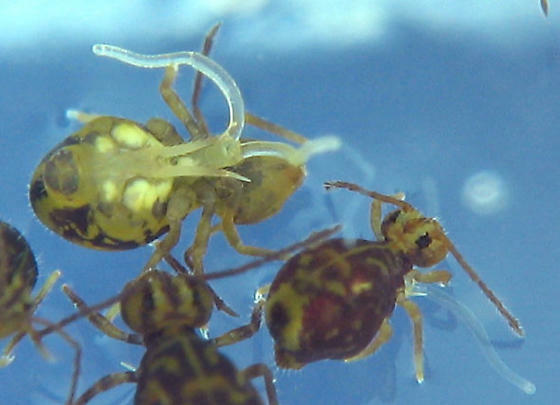 Are you getting hooked on Collembola, now? Fascinating little creatures. I think I've added them to the beetles as far as interest is concerned. I'm already wanting to photograph them in Ecuador. All Collembola have a ventral tube. From this tube they can everse two 'sacs'. In Symphypleona, these sacs are evolved into long tubes. These eversible tubes are multifunctional organs. They are used to regulate the internal osmotic pressure by taking up water with the tips of the eversed sacs/tubes. They are also used as an aid to adhere themselves on a smooth substrate surface. This was obseverd by the firts zoologists that described Collembola, hence the name colla = sticky glue and embolon = plug/pin. In Symphypleona the long eversible tubes are also used for grooming. The specimen lying on its back is trying to use its eversible tubes to get back on its feet. Thanks for explaining Symphypleona anatomy and philology, Frans.